What to expect on a Sunday morning at Vox! I know that a lot of people are nervous about going to a church for the first time. It can be tough because you have no idea what to expect. You might be a little worried that things will be weird and you’ll feel uncomfortable. We get that, so we thought that maybe we’d explain what goes on Sunday mornings to you, so you’ll be a little better prepared. Our service starts at 10:30 am, but many of us struggle to be exactly ‘on time’. Some show up sometime after 10 am to grab a cup of coffee or a treat and connect before we start. This is a great chance to meet a few people, or at least to get a caffeine fix! Transitions can be hard for some of us, so we usually have a countdown timer with 5 minutes notice. This is especially helpful if you’ve got to make a last minute run to the bathroom. We usually start the service off with a few songs that are a little more upbeat and fun for the kids to get involved in. After the first couple of songs, we pause for some announcements. Then we take time to sing Happy Birthday to anyone who celebrated their birthday in the last week. After that we dismiss the kids to our children’s program and break for ten minutes or so. This gives us time to grab another cup of coffee, tea or a nibble. It also gives time to connect a little bit with each other. In case you haven’t noticed, food and community are a pretty big deal to us as a faith community. If you have kids, you’ll want to know that we have several things going on Sunday mornings. First, your little ones are welcome to stay with you if they are more comfortable. We never want folks to feel that they have to separate if that’s uncomfortable. Our nursery is for kids who haven’t started school yet. There are toys and games, snacks and stories for our littlest ones who are ready to move and make noise. The nursery is staffed by an adult and one to two youth, based on numbers. Our JK – Grade 5 kids are our ‘VoxKids’. They have their own program. They use art, movement, songs and stories to explore what it means to follow Jesus in their everyday lives. If you have a child or youth with a disability, please refer to our Accessibility Commitment page for more information on how we can support you and your child. If your child or youth identifies as LGBTQ, please refer to our LGBTQ Commitment page for more info on that. After the coffee break we usually spend a little bit more time singing a few songs and sometimes we watch a short video that’s designed to help get our brains chewing on the topic we’re going to be talking about that morning. When it comes time for the sermon, we are fortunate enough to have our Lead Pastor – Nathan Barnes – two Associate Pastors – Christina MacBean and Roy Snow – as well as a number of other folks in our community to choose from. Whoever is preaching, they are sure to challenge us with some teaching on the scriptures. Their goal is to keep our attention and get us thinking on our own for the rest of the week. 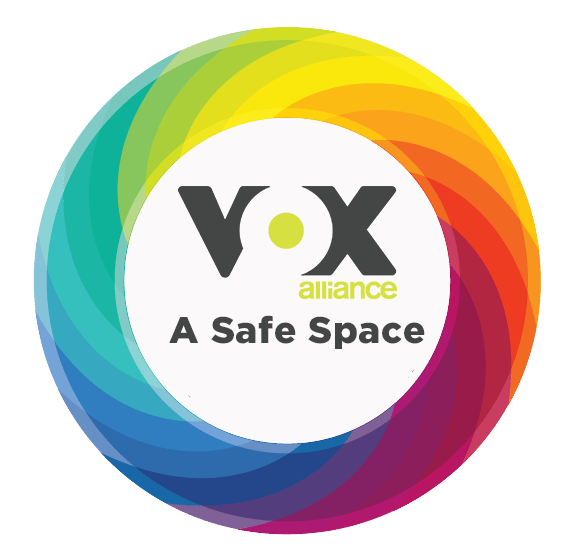 At Vox, we believe that everyone should be able to be included in the conversation. So whether you’ve been going to church your whole life or it’s your first time ever, we use language that everyone can understand. So hopefully, this helps you have a better idea of what you’re getting into before you actually show up at Vox on a Sunday. We’re looking forward to getting to know you.